GRAFTON, Mass. (AP) — It was colder in many parts of the United States last week than it was in Antarctica. For middle school students at Touchstone Community School in Grafton, the weather wasn't the only thing that made them feel like they were in the polar region. PARKERSBURG, W.Va. (AP) — A Parkersburg man's perception of Antarctica changed after an expedition to the frozen continent in December. Wayne Dunn said he connected lots of snow and ice with Antarctica, but after a tour of the Western Peninsula, never imagined there would be so much snow and so much ice on the world's largest desert. SALEM, Va. (AP) — The middle school geography teacher plunged into the icy waters of the Weddell Sea off the coast of Antarctica. But in an extraordinary journey, it wasn't her deepest dive. Judith Painter, who teaches eighth-grade at Andrew Lewis Middle in Salem, was immersed in the frozen continent during winter break. She studied the majestic waters, climate and wildlife through a National Geographic fellowship program for teachers. BALDWIN CITY, Kan. (AP) — A minister from a private Christian university in Kansas has been selected for a two-month deployment as a chaplain at a research center in Antarctica. MINNEAPOLIS (AP) — An astrophysicist from the University of Minnesota who has spent 14 winters in Antarctica tending to a telescope plans to step away from his research after the instrument is replaced. CHICAGO (AP) — "Chicago is the coldest place I've ever been," said Jing Hu, who came from southern China to do her postdoctoral work in materials science at Argonne National Laboratory outside Chicago. MOSCOW (AP) — The Interfax news agency says that a researcher at Russia's Antarctic station has stabbed and injured a colleague in an apparent emotional breakdown. The agency said Tuesday the incident occurred on Oct. 9 at the station's canteen. It added that the injured researcher has been delivered to a hospital in Chile. There has been no immediate comment from the Russian authorities. SCOTIA, N.Y. (AP) — An annual mission to the South Pole that involves hundreds of members of a New York Air National Guard unit is now underway. LAS VEGAS (AP) — Thousands of tourists descend on Death Valley each summer to experience one of the world's most extreme places at its most extreme. Compared with Terry Eddington, these people are amateurs. The National Park Service custodian is about halfway through her first summer in Death Valley, and she has already lived and worked through a July that may go down as the hottest month recorded on Earth. KATHMANDU, Nepal (AP) — An Australian mountaineer scaled Mount Everest on Monday, completing his quest to climb the highest peaks on all seven continents in record time, an expedition organizer said. Australian climber Steve Plain scaled Everest 117 days after beginning his mission in Antarctica. WELLINGTON, New Zealand (AP) — Marine mammal expert Dr. Regina Eisert thought minke whales were a little boring until she captured some striking footage of one swimming underwater near Antarctica. Now she thinks they're beautiful. BUENOS AIRES, Argentina (AP) — A group of American scientists who were stranded in an ice-bound island off the northeastern tip of the Antarctic Peninsula were rescued Sunday by an Argentine icebreaker, U.S. and Argentine authorities said Monday. The four scientists and a support staff member, who were conducting research at Joinville Island, were airlifted by helicopter to the Almirante Irizar icebreaker. As one of a handful of specialists in a largely unexplored field of lake ecology worldwide, a Flathead Lake Biological Station researcher got the chance to study one of the few places on earth colder than Montana for the scientific trip of a lifetime. SCOTIA, N.Y. (AP) — The first group of hundreds of Air National Guard members deployed on an annual South Pole mission has returned to their upstate New York base. The New York National Guard says 22 airmen with the 109th Airlift Wing arrived Wednesday morning at Stratton Air National Guard Base in Schenectady County. They landed aboard a C-17 Globemaster cargo plane assigned to the Air National Guard's 105th Airlift Wing based in Newburgh in the Hudson Valley. Anyone who knows the difficulty sometimes encountered in figuring the amount of snowfall from a passing Front Range winter storm, given the vagaries of swirling winds and varying terrain, might appreciate the challenges Boulder scientists have taken on in Antarctica. PYEONGCHANG, South Korea (AP) — Other than Antarctica, only one continent on the planet has never hosted an Olympic Games: Africa. Finally, though, that could be about to change. But there'll be a step to take before that happens: hosting the much smaller Youth Olympic Games in 2022. IOC President Thomas Bach says a "mini-Olympic event" will be held on the continent, though a specific country has not been selected. The move could signal the possibility of an eventual Olympics in Africa. Running one marathon would be enough of a challenge for most people, but running seven in seven days on seven continents? For D.C. consulting firm executive Jonathan Terrell, it's all for a good cause raising $1 million for Children's National Medical Center in Northwest as a participant in the World Marathon Challenge, which starts Tuesday. LONDON (AP) — A team of British soldiers has become the first all-female group to cross Antarctica using only muscle power. After spending 62 days on the ice, the British Army's Ice Maiden Expedition crossed the finish line at Hercules Inlet on Saturday. The team skied a total of 1,700 kilometers (1,056 miles), traveling coast to coast navigating crevasse fields and pulling sleds weighing 80 kilograms (176 pounds). Temperatures hit as low as -40 C (-40 F). The word charming is a laudatory adjective dont we all want to be considered charming? yet when describing a book, it can sound less than flattering. Charming becomes code for a story thats merely pleasant instead of provocative, one that can be enjoyed, then blithely dismissed. So it was with some concern that the word charming burbled up while reading The Stowaway by Laurie Gwen Shapiro. U.S. marathoner Becca Pizzi is trying to become the first person to have twice completed the World Marathon Challenge — seven marathons in seven days on all seven continents. BOSTON (AP) — She's already run around the planet in world-record time. So what does Becca Pizzi do for an encore? The Massachusetts marathoner, who won the 2016 World Marathon Challenge — seven marathons in seven days on all seven continents — will attempt to become the only person to twice complete the odyssey, which begins in Antarctica on Jan. 30 and ends in Miami on Feb. 5. Why? "I'm certifiably crazy," the Belmont woman jokes. Mars, Antarctica or Mount Everest Base Camp might be warmer alternatives for some Canadians this past Thursday, as the country faces an epic cold snap that has plunged the mercury to record-setting lows in many regions. TOPEKA, Kan. (AP) — December is summer in Antarctica, but on the mountaintops where a team of scientists is studying plants from one of the warmest periods in Earth's history, daily high temperatures average about minus-30 degrees. You read that correctly. Scientists, many from the University of Kansas, are collecting evidence of warm weather plants in a climate so cold it wouldn't register on a household thermometer. There’s good news coming out of Antarctica this fall. The huge ozone hole in the stratosphere down there is shrinking. Its annual maximum in September was smaller than last September’s, and the multi-year trend has been toward smaller maximums as well. Ozone in the stratosphere isn’t just something nice to have; it shields us from the sun’s harmful ultraviolet rays. There’s another ozone hole over the Arctic, but it’s much smaller. The holes exist because of the aerosols we used for decades; the stratosphere at the poles remains loaded with chlorine and bromine, chemicals from the aerosols that work to break down ozone. RENO, Nev. (AP) — Romantic images of cowboys and covered wagons, railroad barons and Gold Rush-era prospectors that typically depict the settling of the American West play only supporting roles at best in a Nevada art exhibit with a broader perspective on Earth's "final frontier." SCOTIA, N.Y. (AP) — Members of an Air National Guard unit based in upstate New York have departed for the 30th season of supporting U.S. scientific missions at the South Pole. Two LC-130s took off early Tuesday morning from Schenectady County's Stratton Air National Guard Base, home of the 109th Airlift Wing. The first flight of the season departed from the base last Friday. Other crews will follow as the unit gears up for its annual Operation Deep Freeze to support McMurdo Station in Antarctica. BELDEN, Miss. (AP) — Dr. George Housley's office at IMA in Tupelo once testified to his love for the outdoors. "George is really a naturalist," said his wife, Vicki Housley. "If you look at his photographs, you'll see that." "I used to have pictures in my office, exam room and down the hall," Housley, 65, said. He retired from his rheumatology practice in April, so people have to go elsewhere to see his photos. CORVALLIS, Ore. (AP) — On Dec. 31, 2014, Noah Strycker was celebrating New Year's Eve in style, basking in a cruise ship hot tub with a bottle of champagne in each hand. But as soon as the clock finished tolling midnight, the 28-year-old Oregon State University graduate got down to work. CAPE CANAVERAL, Fla. (AP) — NASA's asteroid-chasing spacecraft swung by Earth on Friday on its way to a space rock. Launched a year ago, Osiris-Rex passed within 10,711 miles (17,237 kilometers) of the home planet early Friday afternoon — above Antarctica. It used Earth's gravity as a slingshot to put it on a path toward the asteroid Bennu. The idea to start a publishing company came to Aaron Linsdau in 2012 when he was alone in the middle of Antarctica. “I was sitting in my tent in a raging storm, where you can do nothing, and I thought, ‘You know, I want to start my own company,’” the Jackson native said. The extreme adventure athlete was skiing by himself from the coast to the South Pole. That’s about 720 miles one way as the crow flies, he said, but on that terrain the journey wasn’t so straightforward. One of the biggest icebergs ever recorded, a trillion-ton behemoth more than seven times the size of New York City, has broken off of Antarctica, triggering disagreement among scientists over whether global warming is to blame. The event, captured by satellite, happened sometime in the past few days when the giant chunk snapped off an ice shelf. LONDON (AP) — Two polar researchers are set to wed in the first official British marriage in Antarctica. Britons Julie Baum and Tom Sylvester, who have been together for 11 years, will be the first to get married in the British Antarctic Territory since its marriage law was reformed in 2016. The reform made it easier for couples to get a Britain-recognized marriage in the territory. BERLIN (AP) — Scientists say a crack along a key floating ice shelf in Antarctica indicates that a vast iceberg is close to breaking off. The process, known as calving, happens periodically but researchers are watching closely to see whether climate change is affecting the phenomenon. 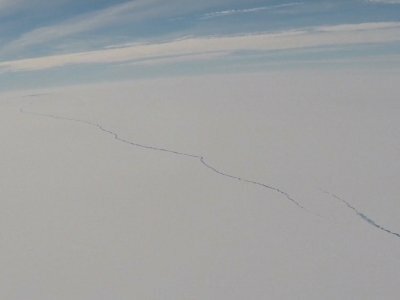 Scientists at the University of Swansea in Britain said Thursday the rift in the Larsen C ice shelf grew by 17 kilometers (10.6 miles) in six days. BEIJING (AP) — A Chinese leader on Tuesday urged international representatives to strike a "proper balance" between environmental and economic interests in Antarctica, as the frozen continent's vulnerability to climate change raises worries that some nations could seek to exploit its natural resources. China is seeking to carve out a greater role in determining the continent's future while hosting delegates from more than two dozen nations that have agreed to an Antarctic protection treaty. BEIJING (AP) — China plans to expand its scientific research in Antarctica in coming years amid worries over the area's susceptibility to climate change, but has no immediate plans to mine or develop natural resources that could be exposed as the ice cap shrinks, government officials said Monday.